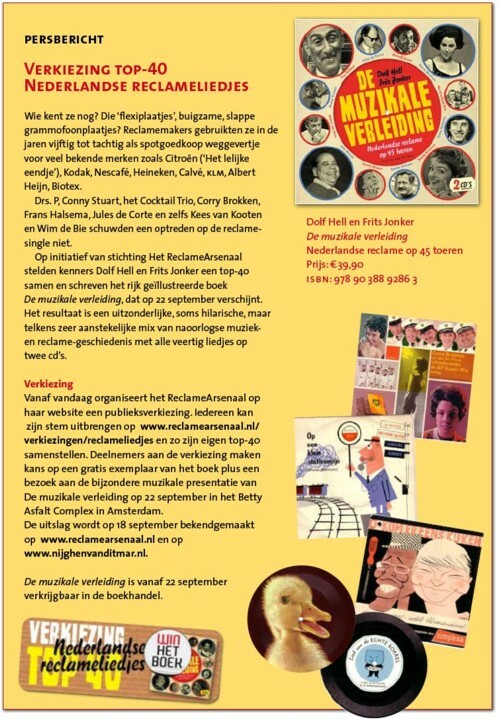 The book about Dutch advertisement records, that Dolf Hell and I have written for Nijgh & Van Ditmar, is finished and should be printed within a few weeks. There is a third party in the story, Pim Reinders, who did an incredible job in making this book possible. He managed to get the copyrights cleared, he got us a publisher, he re-wrote and corrected the texts, and did 1001 other things that will go unmentioned. Pim runs a website, www.reclamearsenaal.nl, that organises a election. There are 100 advertisement records online (streaming audio) and people can vote for the ones they like best. (Here” is a direct link. So far so good. If anybody has suggestions to get some decent publicity for the book, please let me know. I would go the web 2.0 way if I were you: set up a Facebook group, a Twitter account, a MySpace account. Those are the ways to reach your target audience.